I'm looking forward to chatting with you about your wishes and needs for your 2012 Wedding! At a very early age, my grandmother taught me the importance of using “real” ingredients, like fresh butter and whole milk, while my mother developed my passion for being in the kitchen by always letting me cook! Basic pastry and baking techniques became second nature as I presented my own cupcakes for school bake sales and entered fruit pies in the Tulare County Fair. Assorted flavors, made daily, and available Monday-Friday at Hazel's Kitchen in Tulare. Cupcakes are a hit at every party! They are a timeless dessert that reaches all generations, young and old! 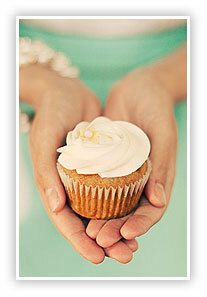 Our favorite flavors include Red Velvet, Chocolate, Banana Caramel, and “The Wedding Cake” cupcake. Each cupcake is accented with a royal icing blossom so be sure to let us know what your color scheme is so we can coordinate! Add the wow-factor to your event with our exclusive Ice Cream Cart! 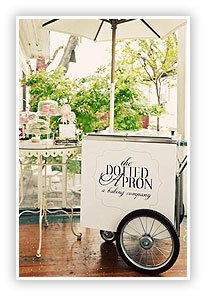 The all new Dotted Apron Ice Cream Cart is making it’s way to your event. Featuring Ice Cream Sundae Station, Pie A-La-Mode and so much more! All set up with our one of a kind ice cream cart and french inspired umbrella. The perfect finishing for your special event. Check back for more details!